Electronics. Smart grids. Circuits. Amplifiers. To some people, these concepts are confusing and not worth understanding. But to you, they’re fascinating. You’ve always been amazed by the power of electricity and magnetism and the ways humans can harness them to make things work. Sound like you? You might be the perfect candidate for Buffalo State College’s Electrical Engineering Technology Program. Electrical engineers design, develop, and test electric equipment like motors, radar, communications systems, and generators. They design and develop electronic equipment from mp3 players to satellites. Electrical Engineering Technicians are needed in the fields of power generation, transmission distribution, power systems protection, and more. When Roger Wood, ’85, studied electrical engineering technology at Buffalo State, two classes—Digital Systems and Control Systems—laid the groundwork for the remarkable career he has enjoyed in the manufacturing industry, culminating in his current role as president and chief executive officer of Dana Holding Corporation. "Those classes required project work and applied theory to real-world applications," said Wood, who later earned a master of business administration from Syracuse University. "They served as the catalyst to formulate my direction on the manufacturing path." Two years ago, the New York Power Authority nominated Buffalo State to become an affiliate university with GridEd, a collaborative educational initiative seeking to develop and train the next generation of power engineers. This affiliation qualified the college for the EPRI award. “The NYPA recognized Buffalo State’s Smart Grid program as a strong and competitive one,” said EET professor Ilya Grinberg. 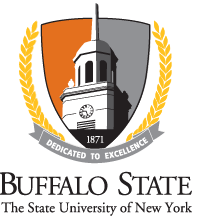 Buffalo State’s bachelor of science in electrical engineering technology: electronics graduates are prepared for careers in the design, testing, fabrication, and application of solid-state circuits and systems (both digital and analog), communication systems, and control systems. This includes consumer products, as well as industrial electronics and computer equipment. Small class size: Typical classes in the major have between 12 and 24 students, which means students receive plenty of individualized attention from faculty. Minor options: Students can supplement the EET major with minors in Quality, Safety Studies, and Energy Systems. SAE Mini Baja Competition - The SAE Mini Baja Competition is one of the most unique and exciting extracurricular activities open to EET majors. The goal of the competition is to design, build, and race off-road vehicles that can withstand the harshest elements and roughest terrain. The vehicles used in Baja SAE racing are often similar in appearance to dune buggies. Buffalo State’s Mini Baja team is made up of EET students who use the competition as their senior project, which is required for graduation from the program.